or a site servicing auction users. 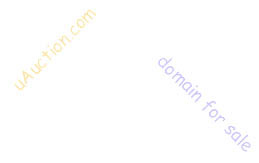 The uAuction.com domain name, all links and traffic to the domain, and any other benefits from controlling these. What was this domain name used for? uAuction.com was an online auction. What about your auction software? What about your customer list? There is no customer list available. We will entertain serious offers. All rights reserved. Reproduction of this page or its contents is prohibited.